The giant, putrid ‘corpse flower’ only blooms ever 2-3 years. It is amazing in it’s size and stench. The smell is likened to that of a decomposing mammal or old compost sitting on your counter. 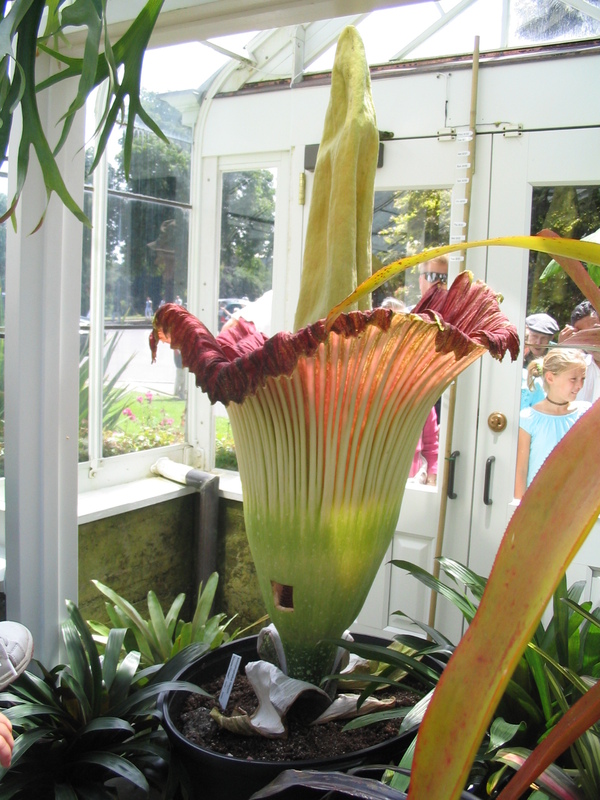 I got to see/smell this one in Seattle in 2011 at the UW greenhouse. Yesterday, I was sweeping the floors. The girls were away and I had an hour so I really went for it. I crouched down and swept under furniture. I swept the dust from the top of the baseboards. I got into the corners and tried to free the dust bunnies that were held captive by invisible spider webs. If I am sweeping more than the major thoroughfares, inevitably, I sweep up some tiny spider home along with the little spider that was hanging out waiting for an unsuspecting microscopic creature to land on it’s web. I can only tell the spider isn’t a speck of dust because it moves in a straight-ish trajectory away from the other dust. These spiders are tiny. I really love sharing my dwelling place with these spiders. They don’t seem all that dangerous (if they are, please don’t tell me), they are unobtrusive and they are evidence, right inside my home, of the amazingness of nature and life. Spinnerets? Webs?! I need frequent reminders of this amazingness because remembering is part of what keeps me engaged and interested in my own life. Sometimes, I’ll be doing something I’ve done 1,000 times before and have decided I don’t enjoy, like dishes, and then I’ll go to scrape food off of a plate and into our compost bucket, which I haven’t taken outside to the pile because I decided I don’t like that either. When I peel back the lid, I get hit with the smell of nature decomposing on my counter. I kind of love-hate gross smells. Sometimes I can’t believe how disgusting old food can be but I kind of like that a smell can make me cringe and want to barf. Is that weird? (If it is, don’t tell me that either.) There is both pleasant and unpleasant in that experience. There is also the reminder that I might not want dishes to pile up or compost to decompose on my counter, but with or without my participation, life goes on. If I pay attention and participate it’s much more interesting and amazing. Now, back to spiders… In my sweeping frenzy yesterday, I swept up a corner cobweb and the spider that constructed it. This spider was bigger than a speck of dust, but not so big to be worthy of carrying outside in a cup with a piece of paper slid under it. I’d say it’s body was the size of a sequin. I decided to let it co-dwell with me, and assuming an air of benevolence, I watched it limp away from the dust pile, a little slower after the broom attack. I expected this spider would find a corner, make a web and that would be that—no big deal. Well, this morning, I was sitting in my bathroom (a-hem), and I looked down and saw the spider with its legs curled up into itself. It was the same spider and it was dead. If it had been one of those teeny spiders, I wouldn’t have noticed it. A dead tiny spider would become dust. This one was that seqin-size one, big enough to see. Somehow, it had walked from my bedroom to my bathroom, which must have been the equivalent of 70 miles in spider distance, and then it curled up right there in the middle of my bathroom floor and died. Seeing this spider and remembering seeing it alive the day before made me feel sad. It really did. I don’t know that I have some big yogic lesson to glean from it, either. But I noticed that being connected to nature and its amazingness doesn’t always feel good. Sometimes little spiders die from green plastic broom bristles. That’s just the way it goes. But I didn’t have the attitude of “oh well, life goes on,” I felt sad. And I didn’t like it. I started to wonder…when I’m making the effort to be present for an experience, why do I expect that it should only be lovely? Why do I think that just because I am better able to focus my attention and listen to the information that comes up in my body and my heart that it will all be sweet? What’s with thinking that connecting and breathing and noticing means I’ll be better able to avoid this broad category of “unpleasant feelings”? We err, and of a lump a monster make. Faced like a man, though better than his own? Yeah, John Donne, what is the deal with thinking that love will last forever and not even considering that it might have a right true end? I like this poem because even though there is such beauty expressed in the love he finds in the one woman he chooses, there is grief, too, right there in the title. You might believe that women in general have all these lovely qualities, like gold, but you choose one, knowing that an end may come to that love. You unite and engage with love, with her, and it is in the participation, in the unity, that you get to feel the love and the grief. They are both there. Don’t go thinking that they aren’t. The chocolate was good, too. I was sad about the little curled up spider. I continue to be amazed by what spiders are and what they can do. It’s all in there- a part of the experience of being connected to the fullness of feeling and the divine. The sadness, the wonder, the beauty is all a part of life and it can show up in your compost bucket, at the end of a broom, or when you are loving someone deeply. Yoga doesn’t claim to keep the bad stuff from happening or even from keeping you from feeling difficult emotions. It does give you tools to refine your perception and stay connected to your SELF, even when little spiders die or much worse stuff comes your way. I understand why we’d all like to avoid unpleasant things, but I just don’t think it is very useful to assume that difficult feelings aren’t inherent in experiencing life. There might be value in feeling those feelings and the reactions to the feelings is where our participation is so meaningful. I guess that’s my lesson. Next > Don’t be so nice to me. It freaks me out. So beautiful. Indeed, to be healthy encompasses the full range of feeling and experience, even those that we would most wish to avoid. Thanks for this poignant reminder. J. Brown. Thanks for reading. Your earliest comment here was one of those moments when I really felt like it was okay to be a little messy and to feel imperfect. So thanks for that, too. On another note, I’ve been commenting on your blog, (2x) and I wonder if they aren’t coming through… I’m diggin’ your posts and glad to get to benefit from your reflections. Hey Amanda- Imperfect is the new cool. I did see one comment you made on this months post and I dropped a quick reply but it looks like you may have forgot to check the little box to receive follow up comments. I didn’t notice any other through the blog but maybe it was a facebook thing? (FB time is at an all time low for me so I’m not always so good keeping up there.) In any case, I do appreciate our blogosphere-born friendship so much. As I believe I have said before, we are singing the same song. First of all, the plant is awesome. Then, I am taken aback that this is what you found in a chocolate bar wrapper. It’s just so wierd. And you read it. Shows restraint. Didn’t just tear the paper away for the candy. Yes, the thing at the end of the broom or in the compost bucket can be sorrowful despite the necessity for dealing with it. You put that beautifully. Think of all the poor people who have been medicated or medicate themselves out of feeling any thing. They are missing part of our humanity. On the other hand, some days it just does feel awfully painful. Yup. Hilary, I love that you thought I read the poem and THEN ate the chocolate bar. Ha. Not exactly. It was more like when the chocolate bar stupor wore off and I was scrounging for little choco-crumbs that might have been left behind in the wrapper, it was then that I accidentally realized that there was a poem on the back of the wrapper. The poem was a consolation, really. Luckily, a good one. AND this thing of medicating ourselves so we don’t feel so much– sometimes it’s important, right? If we are so off balance, sometimes we’ve gotta get some help so we can remember the other side of the scale actually exists. But hopefully we don’t have to stay there. There really is beauty to be found in the whole humanity. Interesting and timely post. I had a similar experience recently. I was being bitten like mad by mosquitos in my room…I had gotten out the mop,…one time, there was a mosquito on the end of the mop and suddenly there was this (felt like) timeless momentary delay on my part when it “came down to it” – I suddenly found that I could not kill it….In that space of time, the mosquito flew away again. It was a strange and interesting expeeience. (and one that i am not sure of its meaning yet either). I love how you described that moment…that something that kept you from squashing the mosquito. I’m trying to notice these moments of pause, even trying to create them, so that I can check in with what’s going on. And What good inquiries on respect for life! I hope some of that makes it into your writing. I’d love to see where you go with it. True dat Kahlil. True dat. “And is not the lute that soothes your spirit, the very wood that was hollowed with knives?” shiiiiiit. Kahlil’s droppin’ some truth-speak. This is a BEAUTIFUL expression of this idea, Jenn. love it. “Together they come, and when one sits, alone with you at your board, remember that the other is asleep upon your bed.” Is this a little creepy? Maybe it is because it is so TRUE. touchee, Jenn. Touchee. (is that even how you spell that?) Those spiders would not be allowed to dwell in my sacred space.